Years ago, who would have ever thought that a broadly stable system such as the financial services industry could be disrupted by technology? How could skilled financial advisors risk losing their jobs to computer algorithms? How on earth could humans ever trust a machine with something as valuable and confidential as their finances? Well, roboadvisors are successfully disrupting the traditional finance industry by offering financial advice and investment management knowledge to consumers with limited to no human intervention required. Roboadvisors are retail-focused, automated wealth management services that use algorithms to evaluate a customer’s risk tolerance and manage assets in low-cost portfolios of exchange-traded funds. The primary customer value proposition of roboadvisors is that they offer investment services to individuals and retirement plans at a fraction of the cost of traditional human advisors. As a result, assets under management (AUM) and total number of retail accounts at roboadvisors has steadily been increasing since 2012. As shown in the charts below, AUM at roboadvisors has grown at a CAGR of +124% from 2012-2015 and number of retail accounts has grown at a CAGR of +639% from 2012-2015. Wealthfront, an automated investment service firm that manages over $8.2bn in assets based out of Redwood City, California, is one roboadvisor platform that has been able to capture immense value within the fintech market. Wealthfront captures value within the industry primarily through the collection of fees from customers in the B2C market. As shown in the chart below, Wealthfront collects 0.25% in annual management fees for account balances of $10,000 or higher. This fee amount is below competitors such as Personal Capital and Xulu but in line with competitors such as Betterment, Acorns, SIGFIG and TradeKing. Secondly, roboadvisor start-ups such as Wealthfront has also been able to capture value in the market through partnerships, capital investments or outright acquisitions by incumbent financial industry players. Many consumers were drawn to the fintech market following distrust of the traditional financial players after the financial crisis. However, one of the primary risks facing roboadvisors is their lack of brand recognition by customers and therefore high customer acquisition costs. As a result, many roboadvisors have moved from a B2C model to a B2B model where they partner with incumbent financial players to offer their services to consumers. For example, Northwestern Mutual acquired Learnvest, Blackrock acquired FutureAdvisor, and Invesco acquired Jemstep. Wealthfront offers investment services for consumers interested in investing their savings, planning for a home purchase, planning for retirement or college, or borrowing a portfolio line of credit to access cash against their investments. For consumers who are interested in opening up an account to invest their savings, Wealthfront first starts by assessing the consumer’s risk tolerance. 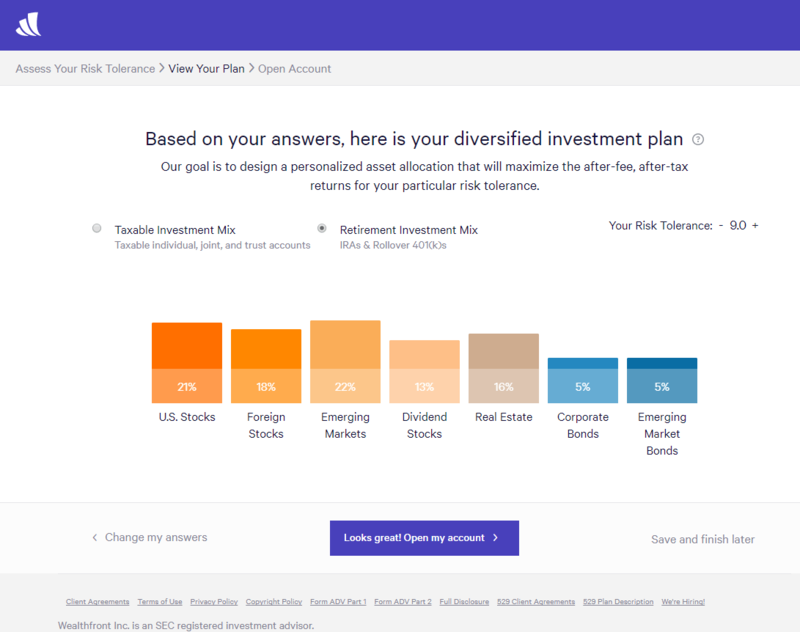 Similar to a traditional financial advisor, the Wealthfront platform asks consumers a series of questions about their age, pre-tax income, rationale for investing and preferences, tax filing status and a behavioral question to assess risk appetite for portfolio losses/gains. 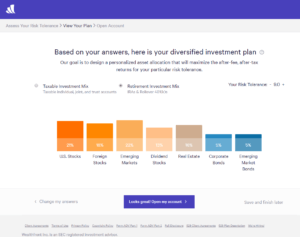 Within seconds, the algorithm proposes a diversified investment plan for a user (similar to the plan below) and prompts the user to open an account and transfer cash to begin investing. Consumers are enticed to try the service through offers such as a low $500 minimum account balance requirement and a promotion that allows for the customer’s first $15,000 to be managed with no fee. My personal view is that roboadvisors such as Wealthfront are the clear winners within the financial services industry and traditional financial advisory companies are losing. 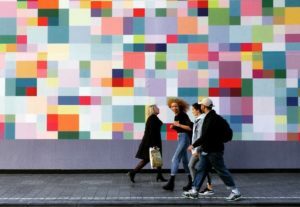 As Generation Z and Millennials continue to dominate the working population and Baby Boomers retire, their high adoption of fintech platforms places further pressure on the traditional financial services companies to react. 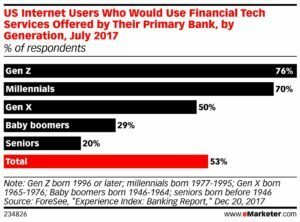 As shown below, in a survey of US internet users, 76% of Generation Z respondents were comfortable using a fintech provider and 70% of Millennials respondents affirmed that view. 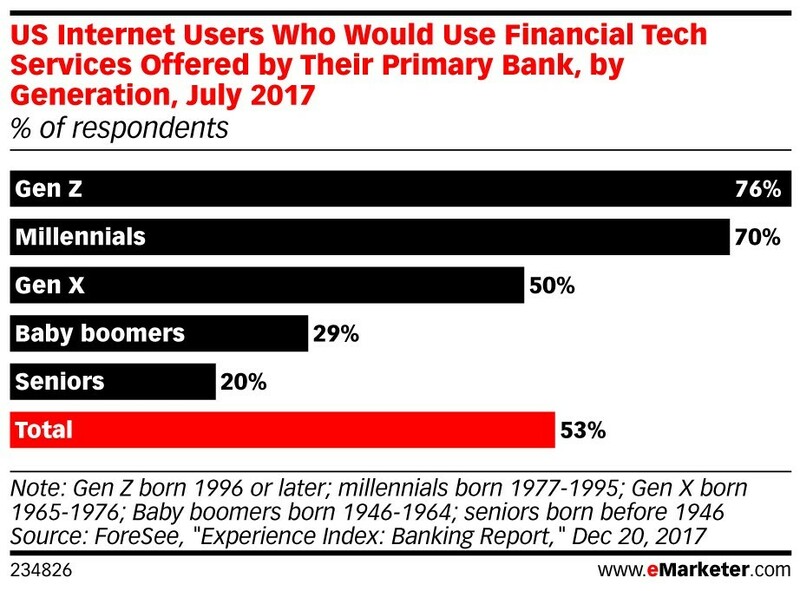 As Baby Boomers and Seniors continue to age, traditional financial services companies will need to continue to adopt fintech technologies and services to meet the needs and demands of the Generation Z and Millennial demographics. Traditional financial services players will need to adopt fintech technologies to continue to be viable players within the industry. Great post, Brittany! I, like you, am huge fan of the concept and technology underlying the wave of roboadvisors. However, I worry about whether roboadvisors actually have the unit economics to survive as stand alone players. As you mentioned, there are very high acquisition costs for new customers in the robo advisor space – estimates range from $300-$1000. 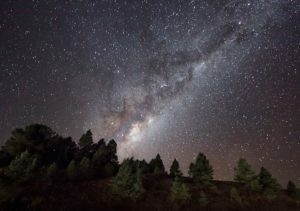 At a .25% fee on a $25,000 dollar account the robo can only recoup $100 per year, which means it could take 3-10 years to have any positive returns (and that’s assuming that there are no major market sell offs and that people will chose to stay with an automated approach as their wealth accumulates across their lifetime). For this reason, many robo advisors have turned to partnerships and acquisitons as you referenced. In this way, they serve as funnels into some of the more expensive, traditional wealth management services rather than an end iteslf. While I really believe in this technology and that many people of our generation and beyond will want to use these services, I think the business models still need some work before they can really “win” on the scale we would like to see them at. Great post! I think an interesting question here is whether anyone, particular consumers, are really “losing?” The current financial advisory system doesn’t work well for many people. A financial advisor often requires a high net-worth minimum to advise a client and charges fees that may not be warranted. Given that most millennials wouldn’t have enough net worth to see a financial advisor anyway, I wonder if the robo-advisors are really taking away customers or just creating a new option for consumers who were originally shut out of this market? Interesting post, Brittany! Robo-advisors are a fascinating example of disruption at work. I agree with Liza that the economics of the platforms are a little suspect! However, one thing that I find particularly interesting is the impact the robo-advisors have hard on the FS industry generally, namely that they have encouraged large FIs to recognize the growing importance of technology in FS and make investments accordingly. As a result, almost every major player in the wealth management industry has either acquired a robo-advisor or started their own (or both). In some cases (e.g., Vanguard, Schwab) these robo-advisors have grown very quickly. It results in an interesting dynamic where these large FIs now have more of a hybrid offering, where they can “shift” lower net worth clients to the passive technology platforms and focus active management on larger accounts. At the same time, the larger FIs also have a broader set of solutions to satisfy more customers (e.g., younger, more tech-savvy). Regardless of their ability to scale into highly profitable, stand-alone organizations, Wealthfront, Betterment and other early robo-advisors certainly have had a meaningful impact on the industry (for the “betterment” of customers!). Thanks for the post Brittany! This space is very interesting to me, as I have a few family members who make a living via active investing. To your point, it is very impressive to see how successful robo advisers have been at drawing new customers in to investment management. To LIza’s point, though, I do worry about robo adviser’s ability to capture the value they have created by attracting new customers. If we use profit as a proxy for value capture, an “active manager” such as Blackstone or a hedge fund is far more successful than a robo adviser at capturing value. It will be interesting to see if these robo advisers layer on value added services to attempt to capture more value, like a traditional investment adviser would. One interesting concept is that of a “robo analyst”, that automates many of the activities performed by an active manager – https://www.forbes.com/sites/greatspeculations/2017/07/19/why-robo-analysts-not-robo-advisors-will-transform-investing/2/#1289e375a39b. Awesome post Brittany! 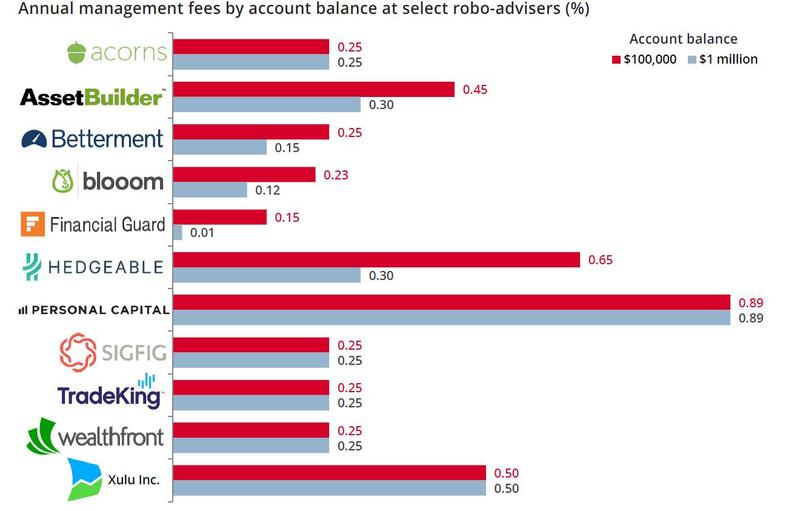 While it may be too early to call roboadvisors “winners” in the wealth management space (particularly considering the high customer acquisition costs) the trends mentioned in your post make a strong argument for roboadvisors going forward. The partnership approach with large financial institutions makes a lot of sense given that incumbents have large customer bases as well as brand recognition, thereby increasing the platform adoption rate while keeping acquisition costs low. For traditional banks, roboadvisors act as new net-positive acquisition funnel because they are targeting younger less wealthy individuals which probably didn’t have access to wealth management services. As these individuals increase their wealth they can be converted into clients of traditional wealth management services at higher margins.